Wondering how to photograph the moon? Artist, Ian Smith, from New Zealand, has sent me this article about how to do so, using a digital camera. Ian visits Far North Queensland every couple of years and used to be a popular artist-in-residence at our old gallery of fine art, exhibiting mostly watercolours of the region. "This photograph, below, was taken from our front lawn at 8.20am yesterday morning. You may raise your eyebrows at the time, 8.20am, as it was fully daylight, but that is the best time to take such a photograph in my opinion. So, if you are wondering how to photograph the moon, my advice is to do it in daylight, or at a bare minimum, partial daylight. The reason for this suggestion is that the contrast between a full moon and the black back-ground of the night sky is far too great for a digital-camera to handle. Most of these cameras (and these days we all use them) use part of the field covered by what's visible in the viewfinder to work out an exposure time. That exposure is greatly influenced by the expanse of black, as opposed to the small amount of white. The exposure, then, is for a black night-sky; the 'subject' doesn't stand a chance, and comes out as a featureless white blob. That is exactly what a correspondent to our daily newspaper sent in as his 'prize' photograph. He might as well have drilled a hole in a piece of tin, held it up against a strong light-source, and photographed that. Seeing I had written about how to photograph the moon on the newspaper's web-site, I felt I should put my money where my mouth was, and act upon my own recommendations. The outcome of that process is the photo, below. 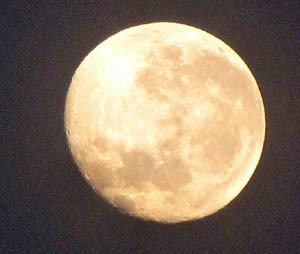 It was taken with a Canon 'Powershot' SX10-IS digital camera which has, from memory, a CCD with 12mPixels. So, it's pretty-much a run-of-the-mill 'domestic' digital camera. I began at 7.10am and took one exposure every five-minutes, hand-holding the camera, but steadying it against a fence. For most of an hour, the shots were just as the other photographer's had been, white blobs on a black background, with no 'detail' whatever. The exposures were 1/8 sec. at f5.6, for most of an hour. You're beginning to approach 'pay-dirt' when that situation begins to change, because that is when the contrast between the two parts of the subject is beginning to bring 'detail' into your subject. Another ten minutes, or so, and you will have all the 'detail' possible, the light-coloured expanses of granite, against the darker areas of basalt, (which are what the moon consists of). Your picture will, likely be like mine, which consisted of the image I wanted, against a mid-toned grey-violet background. You take the best image you have, and digitally enhance it by means of the simple graphics to be found in any decent computer-graphics programme. (Ashampoo's Photo-Optimiser' is good, because it also removes the greyish 'veil' which appears in many digital photographs). The outcome, after a bit of severe 'cropping', might well be similar to the one shown here. It is really pretty simple, and almost anyone with a reasonably modern digital camera could do it. The final exposure of my shot was 1/125th of a second at f5.6 (must have been set on 'aperture-priority'). If you doubt your ability to hold the camera still-enough, use a tripod. My focal-length was (in 35mm camera equivalent), 500mm, which is about the limit of most cameras at present. So, if you want to learn how to photograph the moon, my advice, for what it's worth, is 'give-it-a-go'. You might be surprised at the outcome."